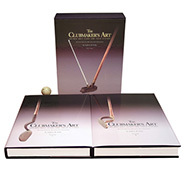 "The publication of The Clubmaker's Art-Second Edition Revised and Expanded will be an enormously useful resource for everyone interested in the memorabilia of golf. Jeff Ellis has devoted years to meticulously researching those golf clubs that have shaped the game. His investigation, which encompasses not only the printed word but also the actual clubs found in both public and private collections throughout the world, was conducted with the diligence and passion that only a collector of these very same objects could possess. The result is a remarkable compilation of historical information and valuable commentary about antique clubs and their collectibility. In the world of golf, no other volume which deals with the equipment of the game is comparable in scope, depth or scholarship to The Clubmaker's Art. Not only is The Clubmaker's Art the most complete and well-documented book of its genre, it will endure for years as such. Already widely known and respected for his knowledge of antique golf clubs, Jeff Ellis has made an immense contribution to all of us in the collecting world-and to the literature of the game." The two volume set ships at 17-18 pounds. Shipping to US address: $20 per set via Post office media mail. Shipping to Canada: $45 per set via Post Office air mail. Shipping to UK and Western Europe: $65 per set via Post Office air mail. Shipping to Japan, Australia, and all other foreign countries: $95 per set via Post office Air mail. The two-volume set with dust jackets and slipcase. Pay Pal account. Or you can use your debit/credit card if you don't have an account. - Call 360-969-2040, to speak with a sales representative. - Fax your order, complete with "ship to" address, to 206-493-2795. Orders are shipped on the day they are received or the next business day by USPS. Money back guarantee if not satisfied with the book for any reason within 7 days of receipt.